Although Tunisia enjoys a Mediterranean setting and is a beach destination for vacationing Europeans, there is much more to this small country than sand and sun. Over the course of 3000 years, Tunisia, the northernmost country of Africa, has witnessed the passage of Phoenicians, Romans, Vandals, Byzantines, Arabs, Turks, Spanish and French. They came as fugitives or adventurers, to conquer or to claim, warriors and missionaries, traders and farmers, each leaving a part of their story in stone or mosaics, on the hills of Carthage and the threshold of the Sahara. 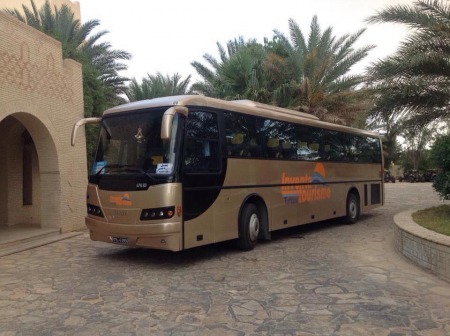 Our journey takes us to many important Roman ruins, to the sands of the Sahara and its desert oases, and to the tranquility of the island of Djerba, referred to by Ulysses as the Land of the Lotus Eaters. Along the way, we are introduced to the customs and cultures of these fascinating regions. On arrival in Tunis you will be met by our representative and transferred to the coastal town of Hammamet. Check in at a resort hotel. Dinner and overnight. Our Tunisian adventure begins this morning as we start our drive south. Our first stop is at the Great Mosque in Kairouan. 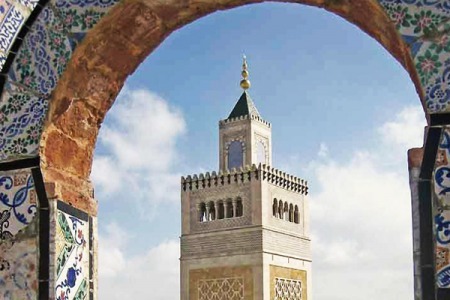 This is the oldest mosque in North Africa with one of the world’s oldest minarets. We will also visit the Mosque of the Barber, the burial place of the one of the Prophet Mohammed’s companions. Here we can also explore the Medina (old city), surrounded by walls. 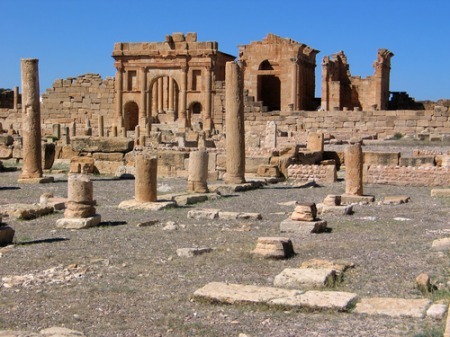 Continue to Sbeitla to visit the Ancient Roman ruins of Sufeitula, containing the best-preserved Forum temples in Tunisia. The ancient town, then held by the Byzantine Prefect Gregory was captured by the Arabs in 647AD and briefly served as capital of the country. 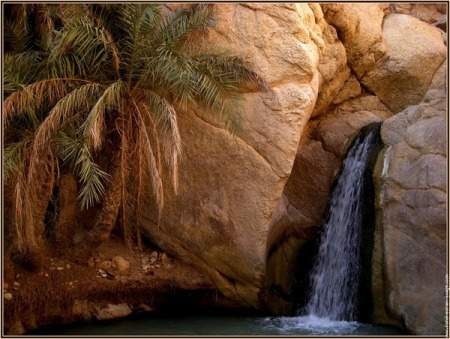 The end of the day brings us to the oasis town of Tozeur with a hundred thousand palm trees. The dates exported from Tozeur are very well known. In Tunis ancient city called "the Medina" of Tozeur, one can find traditional architecture, fashion and workmanship. Today we venture by jeep into the incredible scenery of the mountain oasis towns near Tozeur. Chebika is an ancient town first established by the Romans to link Leveste (Tebessa) in Algeria to Tacapa (Gabes) on the Oriental coast of Tunisia. To communicate with nearby regions, the legionaries used a reflecting mirror. Tamerza is thought to be the Ancient Roman site of Ad Turres, a defensive Roman station that became an Episcopal place in the Byzantine era. Hidden by a chain of mountains, dominating a large plain, the village has a privileged location. Coming down from the village, we can reach “Oued El Khanga” where you can admire a very beautiful cascade. Continue to Ong Jemal or "Camel throat" is an impressive natural site close to the Chott El Jerid. Famous for its unique view on the salty lake the site offers a natural show everyday "sunset above the dunes just for you". In the past the old village of Ong Jemel used to be a stopover for the caravans coming from the desert and kept all its authenticity. Drive back to your hotel in Tozeur. Today’s drive across the salt lake of Chott El Jerid will be a real highlight with multiple opportunities for fabulous photo stops. 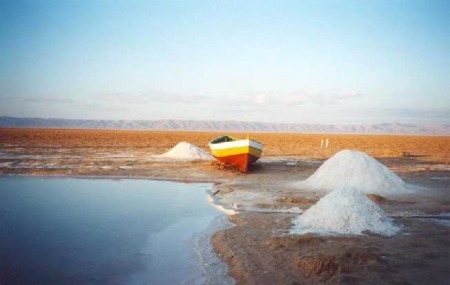 Douz, the gateway to the desert, is located at the far end of the salt lake. In the afternoon we continue on to Matmata. It is difficult to imagine a more spectacular site, a place where you can find more intense colours. Matmata is situated in a basin scattered with countless tiny hills, a lunar country age surrounded by bald mountains. From far, the ground looks riddled with an endless number of craters. These are the Troglodytes houses. This place served as setting for many movies amongst which Star Wars. Here we’ll visit the home of Berber tribes people. Today we explore the Ksour district centred on the rugged hills of the Jebel Dahar Range. We’ll stop to visit 17th century Ksar Medenine with the Ghorfas (stone or mud pigeonholes once used as storehouses) surrounding the central courtyard. 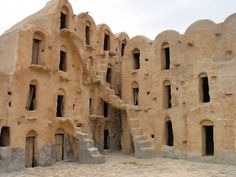 We continue to Tataouine- Tataouine's name became famous when George Lucas, who filmed the Original Star Wars film in various locations of Tunisia (for example, the Lars Homestead, filmed at the Hotel Sidi Driss in Matmata), named Luke Skywalker’s fictional home planet Tatooine. We leave the desert today and begin our drive north. Our route takes us first to the mountain villages of Chenini and Douiret. These villages are made up of cave houses built on the slopes of a mountain with a white mosque in the midst. We arrive in Djerba in the afternoon. The visitor approaching the Island of Djerba, is surprised by its resemblance to Polynesia…when you just arrive there, you have overwhelming feelings of serenity and softness. Djerba was well known during the antiquity since the hero of Homer, Ulysses, stopped there during his trip. Our journey north continues today, travelling through the Ancient Roman city of Gabes and onward to Sfax, once known as the base of the Barbary piracy, prompting an unsuccessful invasion by Venice in 1785. 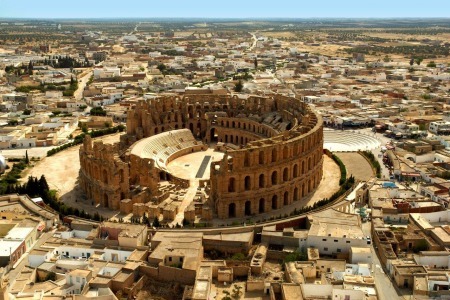 This afternoon we’ll visit the magnificent Ancient Roman amphitheatre at El Jem. This is the third largest amphitheatre in the ancient world with a capacity of 27,000 spectators. Founded in the 9th century B.C, Sousse is the third city in Tunisia after Tunis and Sfax. Constructed by the Arabs in 698, Tunes (Tunis) flourished by itself inside its fortified ramparts. Walking in the Medina (the walled historic centre), you will be charmed by the exotic scents of perfumes and spices. We’ll visit the Bardo Museum, the ancient residence of the beys (dynasty ruling Tunisia from1705 to 1957), which now houses a splendid archaeological Museum. This afternoon, we’ll visit the archaeological site of Carthage, with magnificent features of the Antonin Thermeas and those of the two Punic ports, and the clifftop village of Sidi Bou Saïd. Today is devoted to an exploration of the major Ancient Roman Sites of northern Tunisia. The site at Tuburgo Majus is quite extensive and covers about 40 hectare. It has been partially excavated and is dotted with many buildings, mostly monumental, such as the capitol, with its six façade columns or the temple of Peace and that of Mercury, the summer baths and the winter baths, as well as the market and the residential quarter. 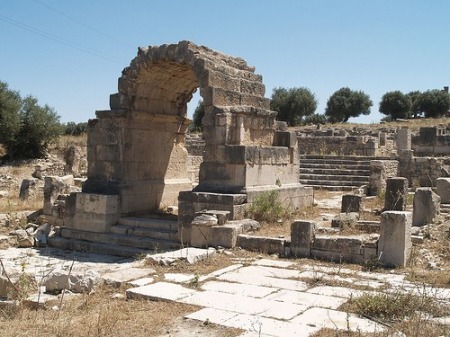 Continue to Dougga, the best-preserved site in Tunisia, a settlement of Numidian origin in the 2nd century BC, later promoted to the status of municipium by the Romans. You can walk along its ancient stone-paved streets and admire its capitol, theatre and other splendid public buildings. Transfer departure to Tunis airport.